This book broadens the scope of inquiry of neo-Victorian studies by focusing primarily on screen adaptations and appropriations of Victorian literature and culture. More specifically, this monograph spotlights the overlapping yet often conflicting drives at work in representations of Victorian heroines in contemporary film and TV. Primorac’s close analyses of screen representations of Victorian women pay special attention to the use of costume and clothes, revealing the tensions between diverse theoretical interventions and generic (often market-oriented) demands. The author elucidates the push and pull between postcolonial critique and nostalgic, often Orientalist spectacle; between feminist textual interventions and postfeminist media images. 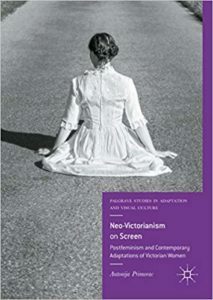 Furthermore, this book examines neo-Victorianism’s relationship with postfeminist media culture and offers an analysis of the politics behind onscreen treatment of Victorian gender roles, family structures, sexuality, and colonial space. Antonija Primorac is Assistant Professor at the Faculty of Humanities and Social Sciences, University of Rijeka, Croatia. Antonija co-edited the 2015 special issue of Neo-Victorian Studies entitled Neo-Victorianism and Globalisation: Transnational Dissemination of Nineteenth-Century Cultural Texts. She has published on adaptation, neo-Victorianism, postcolonial studies, feminist theory, Canadian literature and literature in translation.